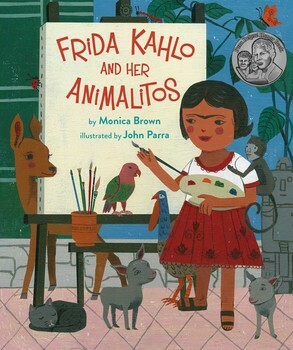 Using lo real marvavilloso, Brown employs the menagerie of pets Kahlo owned as an adult to "highlight Frida's magical creativity - her strength, her sense of adventure, her indomitable spirit - throughout her life." Her parrot, Bonito, represents Frida's love of bold color that "celebrated indigenous Mexico and her own heritage." 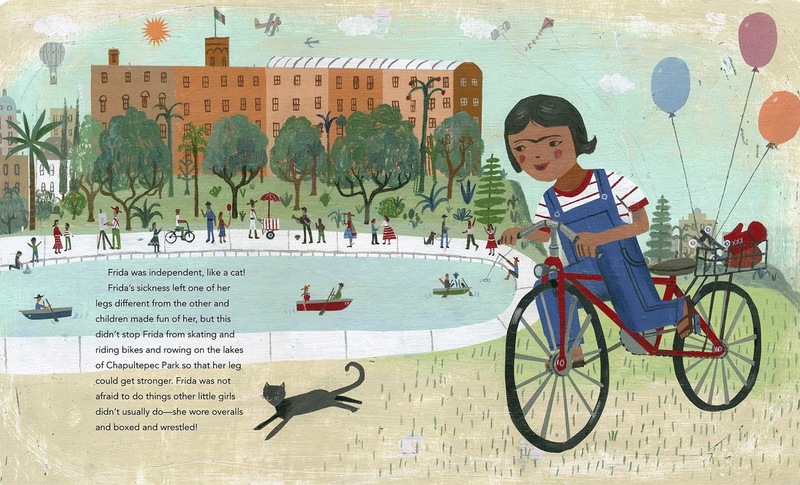 Her pet fawn, Granzio, is like Frida with her, "watchful, beautiful eyes," and her pet cat, with fur the color of Frida's hair, is playful like Frida, who invented a magic friend to escape out the window when she, herself was bedridden. 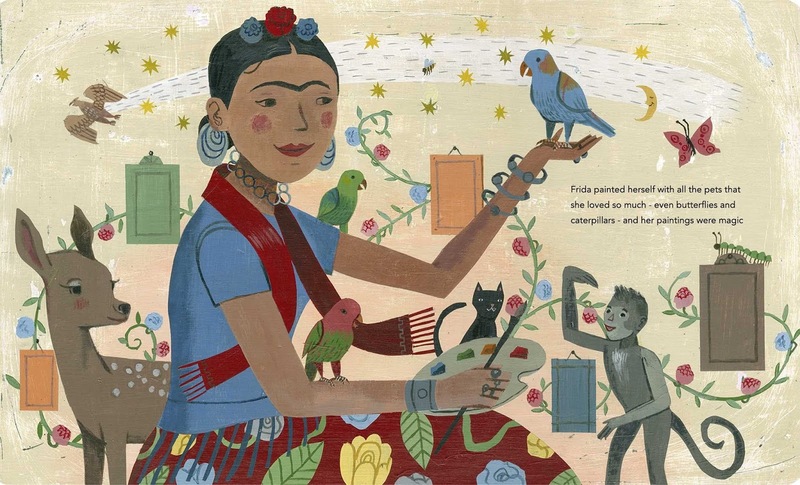 Frida also had two spider monkeys, an eagle, two turkeys and Xolo dogs, a breed that "ran and hunted with the Aztecs thousands of years ago - a reflection of Frida's heritage of which she was very proud." La Casa Azul, Frida's childhood home in Coyoacán, now the Frida Kahlo Museum, was also a home she shared with Diego Rivera, and where he built a pyramid in the backyard for their pets to climb on and roam over. 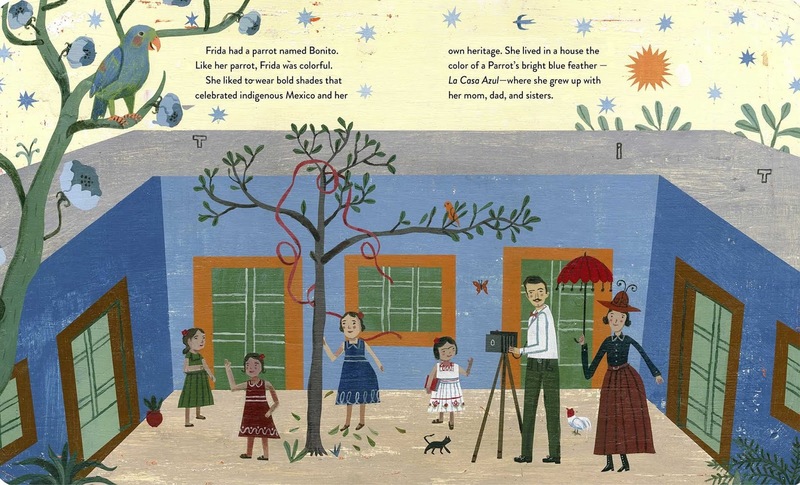 The well known facts about Frida's life, from her illnesses, injury and constant pain, to her painting while confined to her bed are enriched, and made accessible for young readers, with details like the fact that Bonito, the parrot, liked to snuggle under the covers with Frida when she napped. Readers familiar with her work will know that many of her pets are immortalized in her paintings. Knowing that these animals were, in fact, her pets and constant companions makes this fascinating, inspirational, creative woman who changed Mexican art forever even more interesting.